Honey blunts are… well… delicious and amazing. If a joint is the basis of your smoking knowledge, consider this to be your secondary education. Learn how to make one with this video! Before you learn how to make the best, you need to know how to make the rest. Here are my directions on how to roll your basic honey blunt. It’s sure to get you buzzing, but wait until we step it up a notch. The simplest way to enhance the blunt starts off by going for a honey blunt wrapper instead of any old cigar skin. Bring out that flavor every way you can, right? Backwoods and High Hemp are a few brands that carry the honey flavor. Once you have the basic idea down, you must push the boundaries and become Master of Honey Blunts. To do this, the scroll says you must start with the finest herbs. For a honey blunt that will have Winnie the Pooh beating down your door, start with some signature strains that taste even sweeter than they sound. Choose from any of the following, or mix for an even tastier treat. Now the part that makes a honey blunt really shine is the drizzling of sweet honey. Once your blunt is rolled with those scrumptious strains inside, spread a thin layer of honey on top. But wait! Why settle for regular honey, when you can use Cannabis Honey? The THC infusion will knock your socks off! After you add that THC coating, Get some quality kief and finely ground herb from another couple honey strains to liberally coat the outsides of your legendary Honey Blunt. For a finer smoking experience, make yourself an awesome paper filter. You can our how-to guide here. Make sure your wrap is open but curved so the herb doesn’t fall out, and load it up! Have enough to fill your blunt with some left over. Roll it into form, lick it, and stick it! If you are using a cigar instead of a blunt paper with adhesive, you can also use honey (in a very small amount!) to seal the wrapper instead of saliva. Once the blunt is rolled, get some honey and spread a thin layer on the outside, leaving a space at the smoking end for your fingers to hold it so they don’t get sticky. Generally you don’t want honey on the area with a filter in it, since it won’t be smoked. Take your remaining bud, (finely ground), and spread it out on a smooth flat surface. Then roll your sticky blunt in the shake until it has a thick coating. For even better results, use kief, finely ground shatter, or dry hash to take the potency of your honey blunt to the next level! Step 7: Light up and enjoy! Typically it is best to wait a few minutes or hours for it your blunt to dry and cure a bit, but you can usually spark it right away if you are impatient. If you want to add extra layers, you can drizzle fine lines of honey over the coating and sprinkle more kief, or even stretch honey dab and roll a string of it around the blunt, adding even more layers of ecstasy! If you want to put even more character into your creation, you can try some of these specific combinations that have their own names. But bee warned. You might catch a serious buzz. 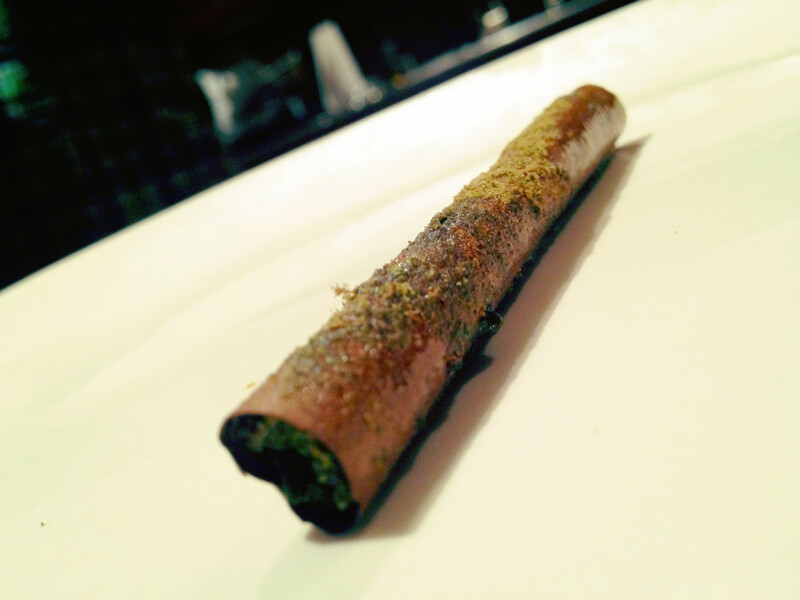 This honey blunt uses a Backwoods Honey cigar skin for that authentic rustic feel. The strain inside is Honey Badger Haze, and the kief on the outside is Black Honey Haze mixed with a dusting of Sweet Skunk. The Hazy Honey Badger is a force to be reckoned with! Take a Backwoods Honey Berry cigar skin, load it up with Honey B strain herb, and coat with a strain with a flower strain ground up and the kief of a berry flavored strain. Bees love flowers and pollen! What fantastic blunt combinations have you come up with? Share your creations on social media or in the comments below.